There's a supermassive brown dwarf in a small orbit that seems to be shaking the entire star system. Since it's around 0.08 solar masses, it's causing the M0 star to wobble which is normal. The system itself isn't wobbling. It does make for an interesting sky for the first planet from the triple. Which star is 0.08 solar masses? 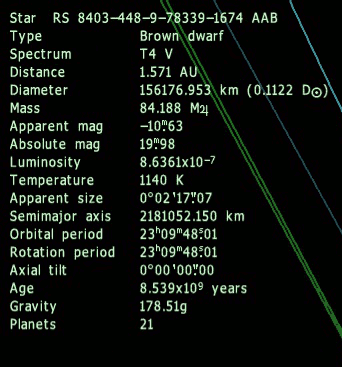 The brown dwarf AAB is 84.188 units of something I'm not sure of, I can't recognize that symbol. Wherever I move, or whatever body in the system I focus onto, all orbits seem to wobble in rhythm with the AAB. What's causing this, am I tracking something wrong maybe? Apparently those are Jupiter masses.